This Knile Davis fumble seemed to launch the Colts to victory Sunday, and coach Andy Reid won't tolerate much of that. KANSAS CITY, Mo. — If any Chiefs fans have wondered what it would be like if rookie Knile Davis were put in the lead back role, chances are they’ll get a preview this Sunday. With the game at San Diego as meaningless for the Chiefs as a preseason game, it seems likely that coach Andy Reid will give his workhorse, Jamaal Charles, a much-needed rest. Reid wouldn’t commit to that Monday, saying he hasn’t decided whether to rest his starters. But there seems little benefit in taking a chance on injury with someone as valuable as Charles. Reid reiterated Monday that he wouldn’t hesitate to rely on Davis. "Do I feel he can step into that role? Yes," Reid said. "You have to feel that way. That’s the way we’ve built that position — if Jamaal ever went down, (Davis) would step in." When reminded that he does have other options at running back, namely Cyrus Gray, Reid simply smiled. "The option we’ve been using is 34 (Davis)," he said. Of course, there is one area of Davis’ game that Reid isn’t too thrilled about, especially following Sunday’s game against the Colts. Davis, known as a fumbler at Arkansas, had fumbled only once this season in 57 touches — and that fumble came after a reception. 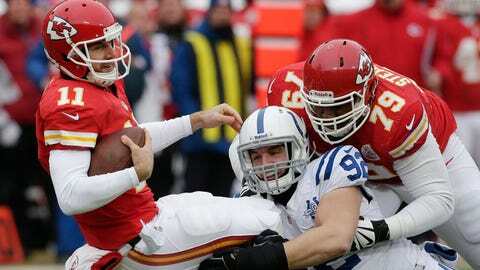 But Sunday, Davis fumbled twice against the Colts, losing one in the first half on a running play with the Chiefs leading 7-3. That lost fumble seemed to turn the game’s momentum. The Colts scored two plays later and never looked back, taking total command of the game. Davis got an earful when he got back to the sideline after that fumble. "They told me to hang onto the ball," Davis said. "Don’t fumble." Davis, of course, didn’t need to be reminded. "I just didn’t have both hands on it," he said after the game. "I didn’t have two hands on it. That’s gonna change." It will have to if Davis is to avoid Reid’s doghouse. Reid certainly is a fan of Davis’ speed and playmaking ability. Davis has rushed for 161 yards in a limited role with two touchdowns. He’s also caught nine passes for 70 yards. And Davis has been a big weapon on special teams, averaging 32.9 yards per kickoff return. He’s also taken one to the house, zipping 108 yards for a touchdown. But one thing Reid won’t tolerate is putting the ball on the ground. "To that point, I thought he’d been making progress," Reid said. "But you can’t touch the ball four times in a game and put two of them on the ground. You just can’t do that. He knows that. "Now, there’s an answer to the problem and we’ve identified it and we’ll make sure that it gets taken care of. "He’s a pretty conscientious kid, a smart kid, and I trust that he’ll get that taken care of." We’ll likely find out Sunday. You can follow Jeffrey Flanagan on Twitter @jflanagankc or email jefffreyflanagan6@gmail.com.